A 318 foot steel railroad car ferry was loaded with 27 box cars and 52 passengers. This is a popular dive destination as there are plenty of things to explore such as railcars, cars, or bath tubs. Penetration is possible for the trained and experienced diver. Known as the “Willie” this is one of the most popular wrecks in Milwaukee. She lies intact on its starboard side at about 80ft with penetrations possible for the trained and experienced divers. 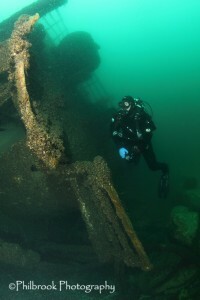 The top side of the wreck can be reached at about 56ft making it a good beginner wreck diving site. While diving this wreck divers can observe the ship in its entirety including a mast on an angle, pilot house, companion ways, and the skylights into the engine room. There are barrels left behind in the cargo holds from when attempts to raise the ship were made. Her bow has been slowly getting berried into the bottom creating an interesting clay wall around. The stern shows the name of the ship and divers have been keeping it clean from algae bloom, zebra and quagga mussels. Overall this is a very exiting dive site for a dive or two or many. Trip Price – $395 (3 days of 2-tank boat dives) Hotel, travel, and meals are not included! Call us at (763) 424-8717 for reservations!